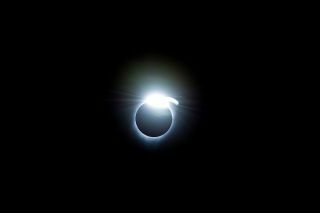 The “diamond-ring effect” is seen during the total solar eclipse of Aug. 21, 2017. This photo was taken from a NASA Gulfstream III aircraft flying 25,000 feet (7,620 meters) over the Oregon coast. In case you didn't notice, people were really into the Great American Solar Eclipse. I mean, really into it. Just take it from NASA. "With more than 90 million page views on nasa.gov and eclipse2017.nasa.gov, we topped our previous web traffic record about seven times over," agency officials wrote in a postmortem on Thursday (Aug. 24). "For much of the eclipse, we had more than a million simultaneous users on our sites. On social media, we reached more than 3.6 billion nonunique users, and Twitter reports there were more than 6 million eclipse tweets that day." NASA also estimates that its live eclipse webcast Monday (Aug. 21) got more than 40 million views, another huge number. "The nasa.gov numbers alone are several times larger than reported streaming numbers for recent Super Bowls, putting the eclipse in the realm of major news, sports and entertainment events," agency officials wrote. User sessions on NASA websites from May 2015-present, as measured by Google Analytics. The excitement isn't hard to understand. The path of totality Monday extended from Oregon to South Carolina, marking the first time that a total solar eclipse had crossed the U.S. mainland coast to coast since 1918. And no total solar eclipse had even touched the continental United States since 1979. If you missed Monday's big event, don't fret: Another total solar eclipse will darken American skies on April 8, 2024, moving northeast from Mexico to Texas and then all the way to Maine and up into Canada. Maybe that one will break some more records.